The contribution of education in economic development has been investigated since the early 1960s, originating in the University of Chicago (Schultz, 1961; Becker, 1964), championed by the Human Capital School – in which expenditure on education is regarded as an investment. It was argued through the endogenous growth theory (Lucas, 1988; Romer, 1990) that spending in education is crucial for increasing labour productivity and accelerating the pace of economic growth. Over the last three decades it has also been proven beyond doubt through numerous empirical researches that individual earnings are positively associated with years of schooling along with the fact that education confers a gamut of positive externalities to the society. Therefore, the much discussed possibility of market failure associated with positive externality brings forth the rationale for public intervention in education. However, public spending in the form of subsidies, on higher education is often argued to be highly inequitable – advocating a drastic cut in subsidies (Psacharopoulos, 1994; World Bank, 1994). This view has gained currency of late and draws attention to the skewed distribution of public subsidies in higher education, with its incidence shown to be distinctly pro-rich. Therefore, spending meagre government resources to finance the higher education of the rich is considered to be a colossal inefficient use of public money. Thus, it is often strongly suggested that scarce government resources should be redirected in favour of basic/primary education. In this article we attempt to scrutinize whether curtailing public spending in higher education would help in achieving the principle of equity? To do this we first investigate how much the government spends on higher education anyway. Realizing the potential of Higher Education in generating myriad positive externalities and a key instrument to inclusive growth, during the post Kothari Commission (1964-66) period more than 20 per cent of total (capital) outlay allocated under education was earmarked to higher education. But with the initiation of new economic policy (NEP) by Government of India in 1991 a general consensus was built in favour of the withdrawal of State from every sphere of the economy. Accordingly, a steep cut in budgetary allocation was inflicted in the Higher Education sector. Educational expenditure expressed as a percentage of gross domestic product (GDP) gives a good indication of the priority given to education in society. 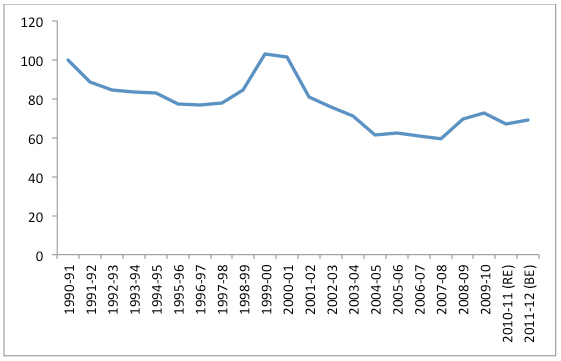 Looking at the proportion of GDP spent on higher education in India between 1990-91 and 2011-12, it is clear that resource allocation towards the sector steadily decreased between 1990-91 and 1998-98 from 0.43 per cent to 0.37 per cent of GDP (Figure 1). There was some revival for two years in 1999-2000 and 2000-01, after which it again started declining. However, from 2008 onwards it has started increasing; even then, public spending on higher education is way below 1 per cent of GDP. For technical education, the situation is even more grave. The expenditure on technical education as a percentage of GDP dipped from 0.14 per cent in 1990-91 to mere 0.10 per cent in 2007-08 and started recovering only recently. Therefore, the gradual reduction of public spending to higher education would definitely have negative impact on per student allocation of government resources. Moreover, this is bound to impact the quality of education in government institutes along with putting more pressure on household budget. Interestingly, developed countries spend close to US$10,000 per student per year. While this figure for developing countries is on an average around US$1000 per student/year, India spends merely US $400 per student/year (Agarwal, 2006). Thus, it will be interesting to find out what has been the trend in per student government expenditure on higher education during the post-reform period. Source: Author’s calculation from Analysis of Budgeted Expenditure and Selected Education Statistics, various years and All India Survey on Higher Education 2010-11 and 2011-12. It is evident from the above figure that the per-student expenditure incurred by government has decreased secularly over the last two decades, having some occasional increase in 1999-2000 and 2000-01. Therefore, it is in this context of an already meagre allocation of government resources towards higher education that the withdrawal of public subsidy from the sector is argued for. There is a longstanding debate over public subsidy in higher education. In public finance theory, public subsidy is advocated normally in case of public goods and merit goods. The aforementioned debate originated from this issue, as many argue that higher education is pure private good and not a public good. On the other hand proponents of public subsidies in higher education state that, as higher education produces a large number of social benefits apart from private benefits, therefore, it is at least a quasi-public good, if not a pure one. Moreover, a large body of literature perceives higher education as a merit good – consumption of which needs to be promoted. Further, subsidy of higher education is strongly recommended to provide equality of opportunity; this is because economists believe that there exists imperfection in the capital market especially in developing countries and consumption smoothening through borrowing may not be possible. Additionally, it is also argued that public subsidies in higher education is instrumental in protecting democratic rights, national values and promote cooperation instead of competition. However, those who recommend withdrawal of public subsidies in higher education characteristically argue that these subsidies are highly regressive in nature – since its incidence is shown to be disproportionately cornered by the higher income groups. It is often argued that as education is financed from government’s tax pool, largely from indirect taxes (around 66 per cent) in India, therefore equally shared by the poorer sections of society – thus subsidization in higher education is inequitable in nature (and hence inefficient use of public money), as it confers high private rate of return to individuals in comparison to social benefit. Hence, they argue for restraining public subsidy in higher education and reallocating it towards primary education. There are also many who believe that higher education is disqualified to become public good for not having criteria of ‘non-excludability’ and ‘non-rivalry’. In this context it would be interesting to investigate the incidence of public subsidies in the Indian higher education sector. Let us look at the incidence of subsidies across different income groups. 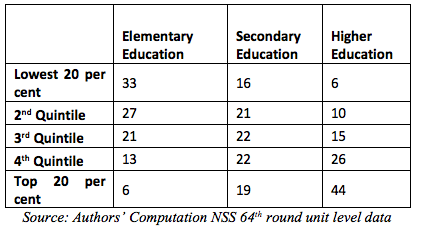 Table 1, drawn upon the unit level data of National Sample Survey 64th round (conducted in the year 2007-08), depicts the incidence of subsidies across income groups (proxied by monthly per capita consumption expenditure) for three levels of education. It is evident from the data that for elementary education the incidence of public subsidy monotonically falls with rising levels of income, which is a clear sign of progressiveness, thus the subsidy in elementary education is pro-poor. However, for secondary education it is less pro-poor and for higher education the 2007-08 data seem to suggest that it is pro-rich. The argument for curtailing public subsidies in higher education and reallocating the same towards other levels of education is forwarded by drawing attention to these results. Now the reason behind such regressive distribution of government subsidies in higher education becomes clear once we look at the distribution of enrolments (in government institutions) from different income groups across three levels of education. The data clearly shows that lower income groups have higher representation in elementary education in government institutions which consistently falls with rising levels of education. At higher education level 44 per cent of total enrolment belongs to the top 20 per cent income group. The most proximate reason for such skewed representation lies in the fact that higher education entails huge amount of out-of-pocket expenditure on the part of household, often making it impossible for lower income households to bear such costs. Additionally, the high opportunity cost of pursuing higher education in terms of forgone current income places lower income households in a disadvantageous position vis-à-vis high income groups. Question arises should public subsidies from higher education be withdrawn on the basis of evidence on current distribution of subsidies depicted in Table 1. Let us imagine for a moment that this is actually done yielding to the demands of those who argue for curtailing government expenditure in higher education. In that case, as the out-of-pocket expenditure in pursing higher education is certainly going to increase and the opportunity cost for pursuing higher education are likely to remain the same – such a policy move is certainly going to increase the total cost (direct + indirect) of pursuing higher education. Evidently, the lower income groups would ill afford higher education in such a scenario and this would unambiguously manifest itself in a further skewed distribution of participation in higher education presented in Table 2. Thus, those who argue in favour of curtailing government expenditure from higher education are actually myopic and only evaluating the public subsidies from the point of view of static efficiency. It is true that the current distribution of public subsidy in higher education is regressive, but on this basis if public expenditure on higher education is withdrawn (which is anyway as meagre as 0.59 per cent of GDP), it will create more perverse representation of poor income groups. This comes out most clearly if we see the current spending incurred by an average Indian household on higher education. According to 2007-08 NSS data the average out-of-pocket expenditure on higher education incurred by a household is around Rs. 7,360 per year per child for general higher education and as high as Rs. 32,112 for technical/professional education (NSS report no 532, p. H-3); whereas per capita income for 2007-08 was only Rs. 33,299 – claiming a whopping 22 per cent and 96 per cent respectively of the household budget. And this is so, even when the government, in whatever measure, is subsidising higher education. Thus, any withdrawal of public subsidies would be an effective way of excluding the lower income groups from accessing higher education in future; as Central Advisory Board of Education (CABE) report (2005) has rightly pointed out that though “…distribution of enrolment in Higher Education is skewed in favour of the affluent section of the society, public subsidization of Higher Education benefits the rich more at the cost of poor. While this is true, the alternative, viz., reducing public subsidies and levying of high rates of fees would accentuate the degree of skewness in distribution; it further reduces access of poor to Higher Education”. Therefore, the call for withdrawal of public subsidy in higher education on the basis of static efficiency seems to be analogous to complete dismantling of caste based reservation on grounds that the opportunities are cornered by the relatively well-off in the caste group. 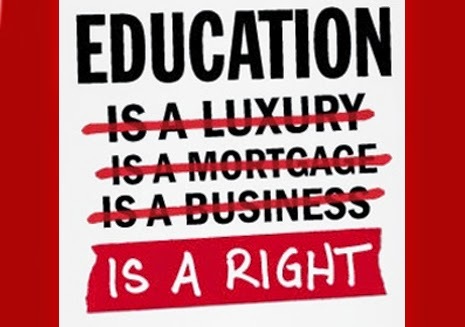 However, any society committed to equitable representation of people (irrespective of their initial economic positions) at every level of education in the long run – thus providing true opportunity for upward social mobility and respects merit – must continue to subsidize all levels of education. Confining oneself to the static efficiency argument would result in an inequitable system in the long run and hence prove to be dynamically inefficient. However, in estimating the optimal amount of subsidies, policy makers can think about introducing discriminatory pricing structure (Verghese et.al, 1985) along with extending specific subsidies like scholarship, free or subsidised hostel facilities etc, as there is no trade off between public subsidies and targeted cost recoveries in case of higher education. Agarwal, P. (2006). Higher Education in India: The Need for Change. WP 180, ICRIER. Becker, G.S. (1964). Human Capital. National Bureau of Economic Research. New York: Columbia University Press. Lucas, R E (1988). On the Mechanics of Economic Development. Journal of Monetary Economics. Vol. 22, 3–22. MDRD (2005). Report of the CABE Committee on Financing Higher & Technical Education, June. National Sample Survey Organisation (NSSO) (2007-08): Education in India: 2007-08, Participation and Expenditure, New Delhi: Department of Statistics, Government of India. Psacharopolous, G. (1994). Returns to Investment in Education: A Global Update, World Development 22 (9): 1325-43. Romer, P.M. (1990) Endogenous Technological Change, Journal of Political Economy 98 (Supplement): S71-S102. Tilak, J.B.G and N.V. Varghese. (1985). Discriminatory Pricing in Education, Occasional Paper No 8, National Institute of Educational Planning and Administration, New Delhi. World Bank. (1994). Higher Eructation: The Lessons of Experience. Washington DC. Authors are Research Scholars at the National University of Educational Planning and Administration (NUEPA), New Delhi.